RULES: All entries must be in by Friday, August 29, 2014 at 9pm EST. This contest is only open to residents of the United States. No international entries will be accepted. Winner(s) will be chosen randomly from valid entries and will be notified by email, so make certain you can receive email from geeksofdoom.com. Winner is subject to eligibility verification. Only one entrant per household. Void where prohibited. Any personal information you supply to Geeks of Doom upon entering this contest will not be shared with any outside parties, except in the case when an outside party is handling prize fulfillment. In that instance the prize winner(s) mailing information will be provided to the fulfillment team. 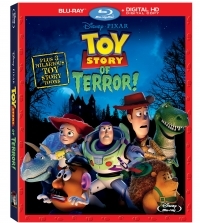 Everyone’s favorite Toys are back in Disney•Pixar’s frightfully fun adventure Toy Story OF TERROR! available for the first time ever on Blu-ray + Digital Copy, DVD, Digital HD, and Disney Movies Anywhere August 19th. 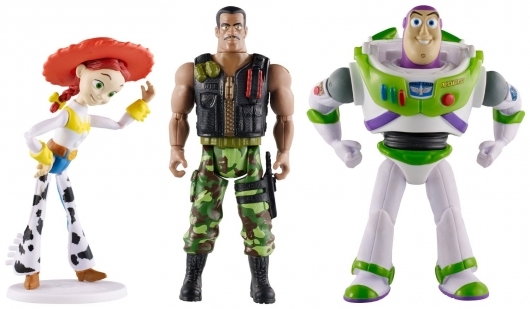 Reuniting after the events of the blockbuster smash “Toy Story 3,” Buzz, Woody and the gang join new friend Combat Carl for a spooky tale full of mystery and humor that’s a must-own for “Toy Story” and Disney•Pixar fans this summer! 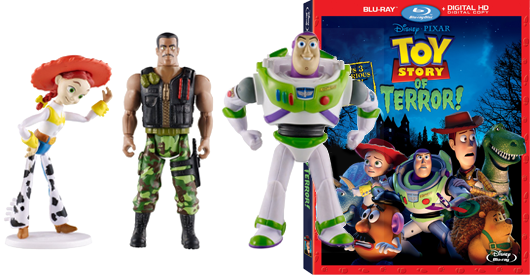 Official Site: Toy Story OF TERROR!